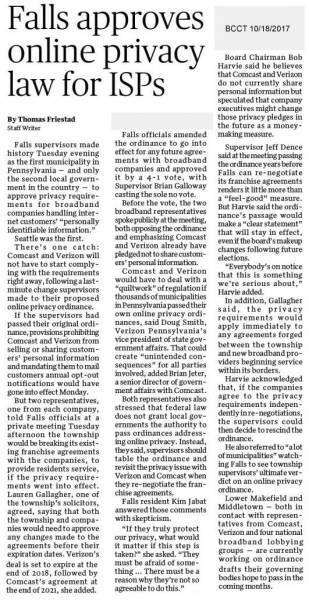 As reported in the January 14, 2018, issue of the Bucks County Courier Times, Verizon is "suing Falls in County court over an ordinance supervisors passed in October to safeguard township residents' online privacy (read "Falls Supervisors Vote to Protect the Online Privacy of Its Residents" below). Even though local governments like Falls are likely to win the legal battle against Verizon to protect the privacy of citizens, officials of other towns like Lower Makefield and Newown might be dissuaded from enacting protections because of the legal bills they would have to pay. Verizon has made it clear it will sue no matter what and it has deep pockets. Not only that, but townships make money from Verizon in franchise fees. At the April 26, 2017, Board of Supervisors meeting, for example, Newtown Township Manager, Kurt Ferguson, pointed out that Newtown collects about $516,000 in franchise fees from Verizon and Comcast. Every decade Newtown and other local municipalities must negotiate franchise contracts with the cable companies. 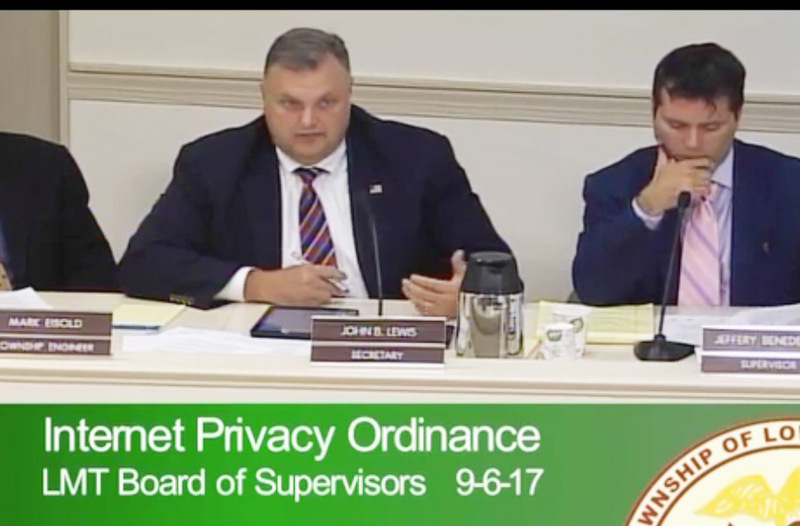 The township is currently in negotiation with Verizon (read “Protecting Your Online Privacy is an Important Local Issue!”). For some background, see my blog post "Protecting Your Online Privacy is an Important Local Issue!". John Lewis (left) proposed an ordinance to protect online privacy. The Board approved to advertise the resolution 4 to 1. The lone dissenting vote was cast by Supervisor Jeff Benedetto (right). After some debate (see the video here), the LMT BOS passed a resolution to advertise the ordinance (see BCCT article below), which is required by PA law before passage of ordinances. If enacted, LMT would join a small number of other local governments that have passed resolutions to regulate online privacy. Two cities in Washington state, Tacoma and Seattle, have been leading America in introducing broadband privacy protections from cable companies at the city level. Middletown Supervisor Amy Strouse said Middletown is modeling an ordinance after LMT's. Several state governments are considering actions as well. LMT Supervisor Benedetto, who is a VP of an online advertising agency, opposed the resolution on the grounds that he was not certain LMT had the authority to legislate online privacy. Comcast and Verizon representatives at the BOS meeting said the same. Other municipalities, however, certainly have such authority. Seattle, for example, has the authority to set new city level broadband privacy rules under Seattle Municipal Code SMC 21.60. For more information, see this article published in the September 10 issue of the Bucks Courier Times.